UK children’s specialist Cake is partnering with a production firm founded by execs behind Angry Birds on a new adventure series. Kingdom of None (52×11′), a 2D show targeting six- to 11-year-olds, is being prepared to debut in 2021. It is being produced by Cake and Ferly (previously known as Kaiken Entertainment), which was founded by former Rovio executives and co-creators of Angry Birds including CEO Mikael Hed. 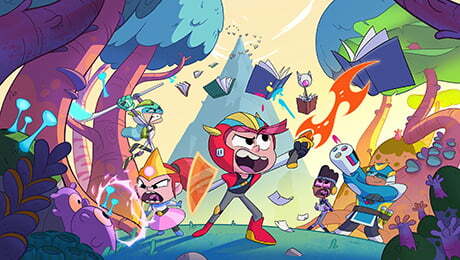 The show, which is being produced with Yellow Animation in Canada, will co-financed by Cake, which will also sell the show globally. It follows five youngsters as they undertake normal activities that turn into extraordinary adventures. The deal comes after Cake’s digital arm, Popcorn Digital, partnered with Ferly’s digital branch. In related news, APC Kids, the children’s entertainment division of coproduction and distribution company About Premium Content (APC), is working on comedy-adventure show Gone Gills through it recently launched studio Zephyr Animation. From Ferly and Yellow Animation, the 3D CGI series follows three prehistoric creatures as they find themselves stranded in today’s world. APC Kids holds global audiovisual distribution rights to the new series, while Ferly manages global gaming rights.